The Flintstones is still a family favorite according to skooldays stats, as it suddely overnight became the most searched for show. 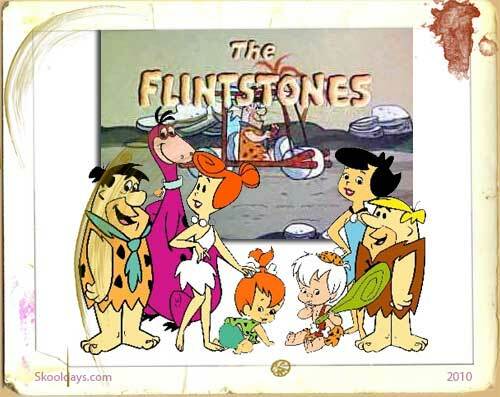 The Flintstones Episodes were 166 in total spanning 6 seasons. The animated series ran from 1960 to 1966. The Flintstones is presently seen in 22 languages in more than 80 countries around the world, and is on somewhere every minute of the day. Writers, recording dates, and air dates are included for each episode. Production numbers are indicated in parentheses. Episodes are listed in production order, which are not always the same order in which they aired. Year at start: 1,000,040 B.C. “Sheriff for a Day” was the Flintstones episodes only production without a laughter track. Barney builds “The Barney Copter,” which Fred renames “The Flintstone Flyer,” and which the boys use to go bowling instead of to the opera with their wives. Fred makes Betty and Wilma disappear (he thinks) in a magic cabinet, and he and Barney join in a hep jam session at the Rockland. Fred and Barney build a joint swimming pool in their backyards, leading to a series of fights prior to a surprise birthday party for Fred. Fred causes Barney to lose his job, so he helps him get a new one–as a furniture repossessor. Fred’s TV set is first on Barney’s list. Knocked on the head by a bottle, Fred becomes “Frederick,” an irritating fop. Fred is the stunt double in Gary Granite’s latest picture. Fred and Barney babysit little Egbert and bring the child to Joe Rockhead’s house so they can watch the fights. Joe’s runtosaurus (and all hell) breaks loose. In order to buy Boulder Dan’s billiard parlor, Fred and Barney turn to gambling. “Come on, Sabre Tooth!” they plead. “DOOON’T bet on the races!” advises a fellow spectator. Barney buys a ring for Betty, Fred hides it, and Wilma finds it–and thinks it’s meant for her. Now Barney has to fight the champ to raise $500. Barney won’t let Fred keep his golf trophy because he hasn’t paid his lodge dues. Fred and Barney buy a lottery ticket and hide it in an old coat; Wilma and Betty buy one and hide it in a coffee pot. Confusion ensues. The boys buy a diner without telling the wives, but have difficulty keeping their secret when the “burger on a bun” girls show up at Fred’s house. Betty and Wilma want to take Judo lessons to defend themselves against a neighborhood burglar. Fred cuts a record at an amusement park and becomes teen singing idol Hi-Fye. Fred and Barney take dance lessons, using Joe Rockhead’s Volunteer Fire Department as a front. Fred and Barney intercept $86,000 in stolen loot, and are soon wanted by both the police and the real robbers. On a hunting trip, the gang encounter a fast-moving, fast-talking snorkasaurus. Fred and Barney try to catch him for dinner. Fred buys a piano from 88 Fingers Louie as an anniversary present for Wilma. Inspired by the Great Mesmo, Fred accidentally hypnotizes Barney into thinking he’s a dog. Barney runs off and winds up in the pound. Fred finds a love letter to Wilma and hires Perry Gunite, a private eye. Fred trades places with J. L. Gotrocks, his rich double. The boys accidentally enlist in the Army and are recruited for a top-secret moon launch. The Flintstones and Rubbles visit the hotel owned by Fred’s old friend Gus (“Smooooothie”) and end up as the only members of the hotel staff just as the Water Buffalo convention rolls into town. Wilma and Betty’s Flint Rubble Double Bubble Cake makes them finalists in a bake-off, but Fred and Barney must assume their identities when the wives get the measles. Fred and Barney lead a Boy Scout troop into danger. Wilma and Betty take in music students as lodgers. Fred’s appearance in a Fat Off Reducing Method commercial leads to his joining Food Anonymous. Taking their cue from _There’s Loot in Lyrics_, Fred and Barney try to pen a hit song. They get a helping hand from Hoagy Carmichael. The Flintstones and the Rubbles agree to take care of Cousin Tumbleweed’s ranch, and unwittingly stumble into the filming of a Western. Fred becomes a school bus driver on the Bedrock-to-Red-Rock route. Fred suspects that his neighbor has killed his wife. The Flintstones return to Rock Mountain Inn to renew their vows, but discover that their original marriage ceremony wasn’t legal. Movie star Rock Quarry attempts to lead a normal life as Gus Schultz, but Wilma and Betty recognize him. Fred and Barney’s private eye business backfires when they become stooges of Boss Rockhead. Fred attends Prinstone U and must balance studying and football practice along with his job at the quarry. When Fred wins money in a poker game and claims he just found it, Wilma makes him run an ad in the paper to find the owner. The Flintstones and the Rubbles attend an ambassador’s ball. Fred and Barney are named judges of the Water Buffalo Lodge’s beauty contest–a fact they must keep from their wives. Fred tries to win favor with his boss at a costume party, but doesn’t know that the costumes have been switched. Fred dumps Barney as Lodge field day partner in favor of trophy-rich Joe Rockhead. Barney and Betty stay with the Flintstones for a week while the Rubbles’ plumbing is being fixed, and Barney’s behavior begins to drive Fred crazy. Wilma and the Rubbles try to keep Fred awake for 72 hours after Dino’s X-ray (showing a case of dinopeptitis) is mistaken for Fred’s. “Betting Freddy’s” gambling obsession returns, and the Flintstone home is soon devoid of furniture. Arnold’s boys club, however, looks great. Wilma is discovered by a TV producer and Fred becomes her manager. Fred woos a female client, Greta Gravel, for Mr. Slate while Wilma is out of town, but Wilma returns early and ends up at the same club as Fred and Greta–who turns out to be Wilma’s old friend. Fred spends Wilma’s secret stash on a bowling ball. When he learns that this is what she was planning to use the money for in the first place, he hires a burglar to put the money back again. Fred insults Barney and then refuses to apologize. Barney gets revenge on prankster Fred by pretending to run a basement counterfeiting operation. Feigning illness so he and Fred can go to a ball game, Barney finds himself in the hospital and scheduled for an operation. After failing a considerate-spouse quiz and missing their anniversary, Fred tries to placate Wilma over a romantic drive-in date and bowl in the championship tournament at the same time. Fred rescues the apparently suicidal J. Montague Gypsum, and pays the price as Monty takes over his home. Fred introduces his mother-in-law to rich rancher Melville J. Muchrocks, then tries to thwart the budding romance when it appears Muchrocks may be a con man. Angry at being passed over for a raise, Fred sends an insulting letter to Mr. Slate–then finds out he has gotten his raise after all, and tries to retrieve the letter before his boss sees it. Fred accepts an invitation for himself, Wilma and the Rubbles to vacation at Sherman Cobblehead’s Golden Cactus Hotel in Rock Vegas. But when he loses all their money gambling he refuses to accept Sherman’s charity, insisting that they work for their keep. The Flintstones and Rubbles share a game show prize, a houseboat that Fred and Barney christen the _Nau-Sea_. A misunderstanding regarding Fred’s old clothes leads to the conclusion that Barney is a kleptomaniac. Wilma encourages Fred to adopt Roberto Rockelini’s romantic manner (and moustache), but his apparent effect on women proves too much for Wilma to bear. Fred becomes umpire for the little-league baseball game between coach Barney’s Bedrock Giants and the Grittsburg Pyrites, but his calls produce unsportsmanlike behavior in the Giants’ fathers. Fred tries to get newly-unemployed Barney a job at the quarry, and Barney is made Executive Vice President in Charge of Production when it turns out he is Mr. Slate’s nephew. Fred’s attempt to cure Barney’s hiccups has an unexpected side effect. Fred enrolls in the Bedrock Dance Studio in order to regain his lost timing before the big bowling match against the Rockland Rockets. Fred tries to get Rock Roll to perform at Wilma’s ladies club benefit. Wilma and Betty follow their husbands to the Lodge convention at Stone Mountain Ski Resort, where jewel thieves have mistaken Barney for their contact. Every member of the Water Buffalo Lodge suddenly comes down with “dipsy-doodle-itis,” which can only be cured by three days away from their wives at Frantic City–but Wilma’s Doozey dodo bird knows the truth and could spoil everything. Wilma is deliberately vague when she tells Fred that Arnold will be staying with them for two weeks, and Fred thinks that Wilma is pregnant. Having told his wealthy Uncle Tex that he and Wilma have a son named “Little Tex,” Fred enlists Barney’s help in ensuring his inheritance. Wilma and Betty win a trip to Rockiki Beach to meet Larry Lava. Fred dons a dress to get into a ball game for free, and he and Barney must deal with an angry Betty and Wilma, Mr. Slate, and an amorous client who has eyes for “Fredericka” and, later, for Wilma. Barney’s toothache creates a headache for Fred, who tries to pull the tooth himself so they can use the money to go to the fights. On the advice of an efficiency expert, Mr. Slate sends Fred back to finish high school, where he is instantly popular with the kids. Fred must take two physicals: one to take out a life insurance policy, and one for a new job as assistant to Conrad Hailstone at Stone Valley Inn. He soon begins to suspect that Wilma is planning to kill him to collect the insurance. Fred and Barney pursue a career in “photo-graphy” when they purchase a Polarock camera. A thief with a romantic touch has Wilma starry-eyed and Fred seeing red. The Flintstones hire a maid, Lollobrickida, who quits before an important dinner. Barney saves a baby, but Fred gets the credit. Will Fred’s conscience let him live with the lie? Fred’s attempts to be nice to Mrs. Slaghoople–“I love my mother-in- law, I *love* my mother-in-law…”–are less than successful. So when the old battle-axe winds up in disguised, part-time cabbie Fred’s taxi, he milks the situation for all it’s worth. Fred hires a housekeeper who turns out to be Grandma Dynamite, the notorious bank robber. Operation Get You a Raise, which involves Barney dressing up as “Mr. Rockafeather” and making a counter-offer for Fred’s services, backfires, and Fred is fired by Mr. Slate. After firing Wilma’s nurse, Fred assumes the household duties and mislays Pebbles. Barney’s voice-throwing trick adds to the general mayhem when he and Fred take Pebbles to a wrestling match. Fred disapproves of Barney’s lowbrow influence on Pebbles, so he moves the family to a snobbish high-society community. While the Flintstones endure a rocky family camping trip, Wilma rents out the house to earn back the vacation money she has already secretly spent on herself. Barney must keep Fred busy while Wilma plans a surprise party for him, but he loses his car with a sleeping Fred inside. Fred and Wilma hire “Annie” to babysit Pebbles, unaware that the young woman is actually Ann-Margrock in town for a show (for which Fred and Barney plan to audition). Fred dreams that Pebbles has married Arnold. After wishing on a falling star, the Rubbles find Bamm-Bamm abandoned on their doorstep. Their attempt to adopt the boy leads to a custody battle involving attorney Perry Masonry. Dino, feeling unloved and unwanted, runs away from home. Fred’s new glasses give him a dangerously distorted view of the world. Fred persuades Barney to sing lead in his barbershop quartet group on the “Hum Along With Herman” show. Fred’s new soft drink doubles as a super glue, and he and Barney are soon joined at the bowling ball. Fred is mistakenly credited with the phenomenal baseball performance of rookie Roger. He plans to usurp Roger’s shot at the big leagues, and the gang give him the cold shoulder. Betty, disguised as elderly Mrs. O-Lady, takes a job purchasing common items with large bills for an equally bogus old woman, who turns out to be a counterfeiter. Wilma and Betty use “sleep teaching” to get what they want out of their husbands, but Fred and Barney catch on and decide to turn the tables on them. Pebbles’ tendency to take anything that isn’t nailed down is exploited by jewel thief Baffles Gravel. D.A. is a club where Bedrock fathers secretly hang out and play cards when they should be walking their children. Fred and Barney attend a wild bachelor party under false pretenses, but the wives may never forgive them if their appearance on “Peek-A- Boo Camera” airs. Fred is held up by a masked man who tells him to raise his arms “nice and slow.” He subsequently engages in dangerous activities to salvage his reputation. A flying saucer drops off ten duplicates of Fred, whose life is turned upside down by their actions. Fred inherits a hillbilly “estate” and is unwillingly pulled into the ancient Hatrock-Flintstone feud. Fred stubbornly refuses to acknowledge that the kitten he brought home has become a hungry and unmanageable mountain lion. Shangri-La-De-Da Valley, far from being the isolated vacation spot the Flintstones and Rubbles were promised, turns out to be the site of a huge gathering of boy scouts. Barney’s deciding vote against Fred in the “Water Buffalo of the Year” run-off leads to a bitter fight over a new room. Dressed as men, Wilma and Betty attempt to join the Water Buffalo Lodge but barely survive the initiation. Fred bores everyone he can with his home movies of Pebbles, then inadvertently captures a robbery on film. Fred dons a monster suit to create publicity for a new horror film, but becomes stuck and is chased by the police and a lovesick finkasaurus. How young Fred and Barney met their future wives while working at the Honeyrock Hotel. Fred and Wilma switch jobs for the day. Will Fred win the Housewife of the Year Award? Fred’s bowling-ball accident necessitates a visit to Dr. Len Frankenstone, who sees an opportunity to test his personality- switching machine. Fred’s experimental reducing formula leaves him a diminished man, a situation he and Barney exploit by putting together a ventriloquist act for the Ed Sullystone Show. “The only caterer in town” muddles two parties, sending the Boulderettes to Pebbles’s kiddie party and Rocko the Clown to the Water Buffalo Lodge. Fred is jealous of Pebbles’ affection for rodeo rider Bony Hurdle, Wilma’s old sweetheart, and enters the Bedrock Rodeo himself to win her back. Fred’s fairy godmother helps him make a splash at Mr. Slate’s party. In order to receive his Uncle Giggles’ inheritance, Fred and co. must spend the night in his uncle’s haunted mansion. Lured by Madam Yes, Fred and Barney must escape (“A judo, a chop chop chop!”) from Dr. Sinister’s island fortress. The Flintstones befriend their next-door neighbors, the strange new inhabitants of Tombstone Manor. Rockeo and Julietta comes to life as the Flintstones and Rubbles enter their children as competitors in a beautiful baby contest. Dino falls in love with the pet of Loudrock, Fred’s obnoxious new neighbor. Fred exchanges places with the King of Stonesylvania. Fred drives Barney’s race car as Goggles Pisano. A Lodge fishing trip on the _HMS Bountystone_ goes awry when Fred and Barney encounter a legendary whaleasaurus. Macyrock Santa Fred must fill in for the actual, ailing Santa Claus on Christmas Eve. Fred “Wings” Flintstone wins a free flying lesson and decides to take the full course after meeting the beautiful instructor. Fred buys a “confisticated car” at a police auction, and is chased by crooks who suspect that the car contains jewels. A trip to the World’s Fair turns into a trip through time as the Flintstones and Rubbles visit future historical eras. The Flintstones move into Bedrock Towers, where Fred takes on the job of Resident Stationary Engineer in addition to his quarry duties. A uranium hunting expedition results in Fred being appointed sheriff of Rocky Gulch just before the Slatery Brothers ride into town. The Flintstones and Rubbles help Fred’s Uncle Tex thwart cowasaurus rustlers on his Texarock ranch. “Boulder’s Rules” apply as Fred and Barney help Aaron Boulder solve a murder mystery. Fred assumes the identity of a television superhero and is framed in a ticket-theft scam. Fred lands a starring role in Hercurock and the Maidens, but he may not survive the filming. Fred (“Troy”) becomes a surfing fool among the teenagers at Rock Island, requiring frequent rescues by lifeguard Jimmy Darrock. Pebbles and Bamm-Bamm’s miraculous singing ability leads to overnight stardom. Fred and Barney restore an old house for Fred’s mother-in-law. Fred wins Stony Curtis’s services in connection with the star’s upcoming picture, _Slave Boy_. Jury foreman Fred fears for his life after he delivers a guilty verdict for vicious Mangler–who escapes from prison. Fred buys a circus, whose unpaid acts all walk out–leaving the Flintstones and Rubbles to fill in. Unknowingly aided by the magic of their new neighbor Samantha, Wilma and Betty compete with Fred and Barney in the area of woodland survival. Gazoo, a political exile from the planet Zetox, is assigned to serve prehistoric “dumb-dumbs” Fred and Barney. Fred falls asleep at the quarry’s annual picnic and finds himself in Bedrock’s future, where Barney is a millionaire, Pebbles and Bamm-Bamm are married, and Wilma is a lonely old woman. Once again fired by Mr. Slate, Fred attempts to market Wilma’s gravelberry pies, but finds he is losing money on the deal. Barney and Fred are kidnapped by Stonefinger and his henchmen, who have mistaken Barney for scientist Dr. Rockenheimer. Will Gazoo rescue the boys? The promotional campaign for a new singing group, the Wayouts, has Bedrock’s panic-stricken populace fearful of an alien invasion–and Fred is wearing a spaceman outfit for the Lodge costume party. Fred injures his foot and creates a dance sensation, “The Frantic.” “Shinrock” host Jimmy O’Neillstone is so impressed he books Fred to appear on the program. Barney is mistaken for Stonyrock-arabian prince Barbaruba and given the royal treatment, but Fred is suspicious. Fred and Barney go bowling while “Fred and Barney nothing” (Gazoo- created duplicates who can only say “Yes, yes, yes” and “No, no no”) take the wives to dinner. A fight sparked by differing beliefs as to which gender has “the superior mind” causes Fred to move in with Barney, and Betty to stay with Wilma. The wrong bottle of pills turns Fred into an ape instead of curing his sneezing. Fred is skeptical of Barney’s magazine about the future, until Gazoo transports the Flintstones and Rubbles there. Gazoo’s dinosaur-race betting tips prove too accurate, and Fred and Barney are targeted by Big Ed and his bookies. Fred and Barney are tricked into purchasing a worthless claim of land. When they suddenly find gold, the two con men who sold them the land set about getting the claim back. Fred turns down the leading male role in _Romeorock and Julietstone_, but replacement Barney seems hopeless in the part. Gazoo lets Fred experience what it’s like to run the show for a change. Tricked into painting Mr. Slate’s yacht, Fred and Barney are cast adrift and find themselves on a seemingly deserted island. Fred fakes a headache so he can go bowling, but the thought of Wilma’s old boyfriend and new dinner date, Wilbur Terwilligerock, keeps him from concentrating on his game. Dripper, a performing sealosaurus, follows Barney home from the Oceanrock Aquarium, but a pair of criminals have followed Dripper. The Flintstones are accepted into the Stonyside Country Club when an overhead conversation about Dino’s lineage is misunderstood to be about Fred’s. Gazoo sets about helping Fred get culture. The perusal of Grandpa Flintstone’s diary tells the story of his World War I adventures. Pebbles and Bamm Bamm Show was a spin-off of one of America’s most beloved cartoon families, The Flintstones. The Flintstones Movie included John Goodman, Elizabeth Perkins, Rick Moranis, Rosie O’Donnell and Elizabeth Taylor. This entry was posted in Cartoon, LunchBox, Movies, Saturday and tagged 1960, 1970 by Skooldays. Bookmark the permalink.